Merrell says:"Keeping you sure-footed on the edge, this extremely lightweight speed hiker is made for the ultimate adrenalized climbs and scrambles. Tenacious, durable and waterproof, this more supportive mid boot keeps feet dry and spares every ounce, strategically placing cushioning where you need it: more at the heel buffers the descent, while it tapers at the forefoot for maximum ground feel and responsiveness over variable terrain." When I was first given a pair of Merrell Capra Mid Sport GTX Walking Boots for testing I was amazed at how lightweight they were. At just 454g per boot they were lighter than the trousers I was wearing and more than half the weight of some of my more traditional leather walking boots. The sole appeared stiff and sturdy enough for hiking some of the UK's highest peaks and they looked fantastic. Now that I've been wearing them during several fell-walking trips on some of Wainwright's Outlying Fells and Parkhouse Hill and Chrome Hill in The Peak District's White Peak my initial views have changed a little. The soles are made from Vibram® rubber, and have provided excellent grip on all kinds of terrain. The lugs are deepish but the sole has softened and become very flexible. The initial lateral stiffness has also disappeared making these boots unsuitable for rough and rocky ground (I could feel every stone I stepped on) and offer little protection during foot twisting steep descents down scree or grass. The lacing system starts relatively close to the toe box so I could tighten the boots along the full length of my feet but there are no locking lugs. The laces themselves are the thin flat kind that you see on trainers and other lightweight walking shoes and could be a little longer since I found tying a double bow quite difficult. While the toe box does have some strengthening, there is no rand on the sides and back of the boot so we shall have to see how that affects the wear rate. The uppers are synthetic leather and mesh and are very thin, offering little protection to the upper part of your feet. In fact it so thin that whilst I was standing in a stream testing for water ingress, my feet became quite chilled as the mountain water rushed past. For this reason I think this boot would be unsuitable in snow and icy conditions. However, they do have a Gore-Tex lining and are certainly waterproof and breathable. Despite the uppers being thin, there is plenty of cushioning on the sides of the ankle and heel and when it comes to the fit - they fit wonderfully well. 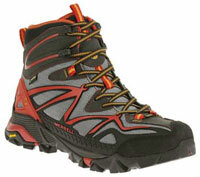 In fact, I think the Merrell Capra Mid Sport GTX are the most comfortable walking boots I have ever worn! Stylish, classy and with looks to die for, the Merrell Capra Mid Sport GTX is a boot to be seen in on the hill! They are very lightweight but that lightness comes at a cost in performance and they are not recommended for the rough and stony ground up most of the UK's mountains and definitely not suitable for walking through snow and ice. However, for more gentle spring and summer walks in the White Peak, The Chilterns, The South Downs or similar the Merrell Capra Mid Sport GTX are a great looking, waterproof and really lightweight walking boot that will not disappoint.